This tutorial and the mask used for this lesson are © Designwell and may not be copied or uploaded to your own server or used as your own material. You're not allowed to link this lesson without my permission. When you see this lesson with no source, then I would appreciate it if you want to inform me. If you want to link this lesson, please send me an email. This lesson was written in PSP 9, but can also be made in the other versions with making small adjustments. Thank you Zial for translating this tutorial! * In this tutorial we make the left example on top of this page with a tube. 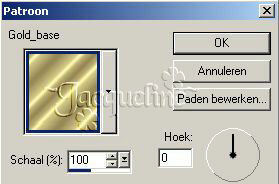 Open the mask we will use (NavyBlueMask.psp) in PSP, close the 'copyright' layer by clicking on the eye. 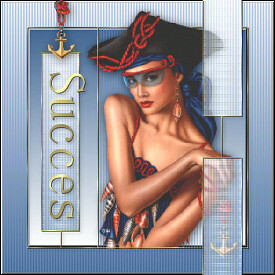 Open tube 'Navyblue.psp with the anchor' in PSP, or your own tube or image. Open a new White image of 350x350 pixels. Layers - New raster layer - name this layer 'Frame'. Activate again layer 'Frame'. Activate your Magic wand (Feather and Tolerance to 0). With the selection running, select the bottom (background layer). Flood fill with white (change your foreground from pattern to color). - Light from left / top - checked. Set the opacity of this layer to 50%. Flood fill with your background pattern. Effects - Plugins - FM Tile Tools - Blend Emboss - default settings. Repeat this effect 1x. Set the Blend mode of this layer to 'Screen'. Activate the bottom 'background' layer. Selections - Load/save selection - Load selection from Alpha channel - select 'Border'. Flood fill the selection with your background gradient. Effects - Plugins - BorderMania - 3D BW Raised #1 - Border width 1 - Notch Corners checked. - Light from left/top - checked. 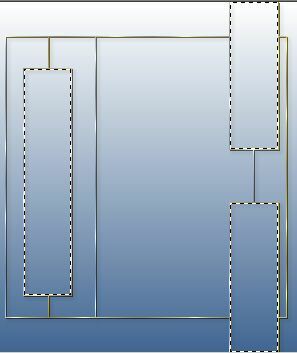 Effecten - Plugins - BorderMania - 3D BW Raised #2 (Border width 1 - Notch Corners checked). Activate your top layer - close the bottom one (background). Maximize the tube from this lesson or your own tube. Back to your main image. Set the tube/image on its place. Image - Resize (Note: All layers NOT checked). Selections - Load/save selection - Load selection from Alpha channal - select 'Border'. Selections - Invert - hit the delete button or use your Eraser tool to do this manually. Activate your Eraser tool and erase that part of your tube that you want to be 'under' the gold edge. To place the anchor repeat this step (ps. don't forget to activate the 'anchor' layer before your copy it. Image - Rotate - Free rotate - Right - 90 - nothing checked. I gave the text the same 2 drop shadows as described in step 2. Set the text on it's place and your 'Navy Blue Tag of Frame' is ready!